A hard cap on earning Valor (or any currency) essentially sets a weekly benchmark, and falling short of that benchmark leaves you feeling like you've left something on the table. If we artificially cap earning at 1000/week, then we're saying it takes ~8 weeks to fully upgrade your gear, assuming "maximum" effort each week. If you miss a week, then you're a week "behind." If you're busy, or sick, or just don't feel like it, and you fall a bit short of the cap one week, then you are delaying completion by precisely that amount. The existence of the cap makes the whole thing feel more mandatory in a sense, with motivation level then plummeting the moment you hit that weekly cap. Despite all these reasons, sometimes we do need caps as a pacing mechanism, particularly early in an expansion or where the impact on player power is massive (e.g. buying Conquest gear in a new arena season). Without a cap, there's an inherent diminishing return curve at play. You can start off doing the most efficient and engaging activities first, until you've exhausted those, leaving you with activities that are progressively less efficient and/or less suited to your playstyle preferences, combined with the fact that you also inherently are exhausting your free time as you go, with your remaining time presumably becoming more valuable as it dwindles. At some point, you generally hit a threshold where the reward for the next incremental activity no longer seems worth the time investment required, and you're done for the week. For many people, that threshold will be reached at lower than 1000 VP per week, and their experience is no different whether or not there's a cap. For others, that threshold will be reached at a point above 1000 VP, and the lack of a cap gives them the freedom to decide when they're done rather than having it dictated to them. Some will benefit from the fact that they're allowed to convert a weekend of free time into a bunch of Valor to make up for that week when they were busy or traveling, coming out even or ahead rather than being permanently "behind" due to a cap. In this case, we opted for the design that offers more freedom to select the sources of Valor that most suit your preferred playstyle, goals, and available time. If you're into Mythic dungeons, then Mythic dungeons are going to be by far the most lucrative source of Valor, and should let you cover your needs quickly. 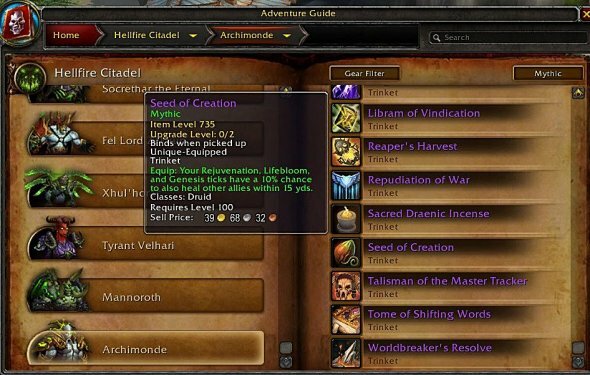 But for players who don't want to run Mythic dungeons, queued alternatives (such as Heroics and Raid Finder) allow for a way to still earn Valor. I understand the sense of obligation to maximize performance in a competitive raid environment, but the game asks competitive raiders to make those choices constantly: do you craft every upgrade at the first opportunity, use the best gems in items you might replace soon, use the best food or Augment Runes on every pull, keep running lower difficulties on the off-chance of a Warforged/socketed perfect drop that could be an upgrade, keep up with multiple specs or alts to allow you to optimize for specific encounters, and so forth? Virtually everyone draws a line somehow and compromises in most of these areas, making a judgment about the point at which further expense (whether of gold, or time, or effort) is no longer worth the benefit. This system presents another one of those choices. The need to "save players from themselves" is a familiar refrain - but past experience has shown that people are better at managing their schedules and gameplay choices than many of the comments in this thread would suggest. The focus of the patch is on dungeon content. Raid Finder was included as a source to add a few more options for Group Finder queuing, and if getting a few well-geared tanks and healers to hop back into Raid Finder improves queues a bit for the core Raid Finder audience, that's not the worst thing in the world. But if you hate Raid Finder, there are literally thousands of Valor available weekly without setting foot in Raid Finder.